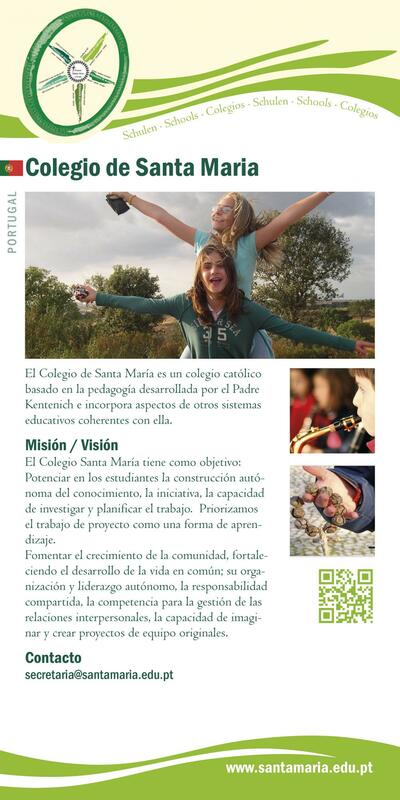 The Colegio de Santa Maria is a Catholic school based on the pedagogical teaching of Fr Kentenich, while at the same time taking in aspects of other, related educational systems. The school has the folliowing aims: Promoting the development of the students with regard to: building up their knowledge independently, developing their own intiative, independent research, planning work, evaluating and defending their work, setting priorities in their studies. Promoting the growth of the community and improving the life developing within a group: the organisation and indepen- dent leadership of the group, common responsibility, develo- ping competence in building up relationships, and the ability to think up and carry out original group projects.